Tree pruning may be necessary to maintain a tree, keep it in a safe condition, remove dead branches, promote growth, regulate size and shape, or to improve the quality of flowers, fruit or timber. Improper pruning can lead to trees becoming unsightly, diseased and/or potentially dangerous. 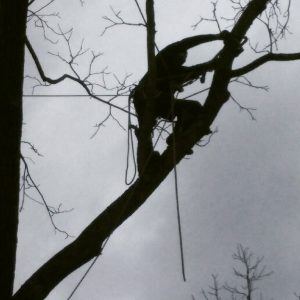 It is important that clients understand the basic terms commonly used to describe tree work operations so that they can ask for what they want or understand what the arboriculturist is recommending. Did you know, for example, that a ‘20% crown thin’ will not reduce the height of the tree? Nor will a ‘crown lift to 4m’. The three main pruning options are shown below and after that, a glossary of other terms that you may find helpful. These are very general summaries and contacting us at Tree Tech Tree Services, can provide more detailed guidance. Crown thinning is the removal of a portion of smaller/tertiary branches, usually at the outer crown, to produce a uniform density of foliage around an evenly spaced branch structure. It is usually confined to broad-leaved species. Crown thinning does not alter the overall size or shape of the tree. Material should be removed systematically throughout the tree, should not exceed the stated percentage and not more than 30% overall. Common reasons for crown thinning are to allow more light to pass through the tree, reduce wind resistance, reduce weight (but this does not necessarily reduce leverage on the structure) and is rarely a one-time operation, particularly on species that are known to produce large amounts of epicormic growth. Crown lifting is the removal of the lowest branches and/or preparing of lower branches for future removal. Good practice dictates crown lifting should not normally include the removal of large branches growing directly from the trunk as this can cause large wounds which can become extensively decayed leading to further, long term problems or more short term biomechanical instability. Crown lifting on older, mature trees should be avoided or restricted to secondary branches or shortening of primary branches rather than the whole removal wherever possible. Crown lifting is an effective method of increasing light transmission to areas closer to the tree or to enable access under the crown but should be restricted to less than 15% of the live crown height and leave the crown at least two thirds of the total height of the tree. Crown lifting should be specified with reference to a fixed point, e.g. ‘crown lift to give 5.5m clearance above ground level’. The reduction in height and/or spread of the crown (the foliage bearing portions) of a trees. Crown reduction may be used to activate mechanical stress on individual branches or the whole tree, make the tree more suited to its immediate environment or to reduce the effects of shading and light loss, etc. The final result should retain the main framework of the crown, and so a significant proportion of the leaf bearing structure, and leave a similar, although smaller outline, and not necessarily achieve symmetry for its own sake. Crown reduction cuts should be as small as possible and in general not exceed 100 mm diameter unless there is an overriding need to do so. Reductions should be specified by actual measurements, where possible, and reflect the finished result, but may also refer to lengths of parts to be removed to aid clarity, e.g. ‘crown reduce in height by 2.0m and lateral spread by 1.0m, all round, to finished crown dimensions of 18m in height by 11m in spread (all measurements approximate.)’. Not all species are suitable for this treatment and crown reduction should not be confused with ‘topping’, an indiscriminate and harmful treatment. Natural features of a fork or union that may or may not be visually obvious. Neither the branch bark ridge or collar should be cut. A void within the solid structure of the tree, normally associated with decay or deterioration of the woody tissues. May be dry or hold water, if the latter it should not be drained. Only soft decomposing tissue should be removed if necessary to access the extent. No attempt should be made to cut or expose living tissue. Two or more, generally upright, stems of roughly equal size and vigor competing with each other for dominance. Where these arise from a common union the structural integrity of that union should be assessed. When a tree exhibits signs of a lack of vitality such as reduced leaf size, color or density. Tips of branches exhibit no signs of life due to age or external influences. Decline may progress, stabilize or reverse as the tree adapts to its new situation. The application of a substance usually to the tree’s rooting area (and occasionally to the tree) to promote tree growth or reverse or reduce decline. This was only be effective if nutrient deficiency is confirmed. If decline is the result of other factors such as compaction, physical damage, toxins etc., the application of fertiliser will not make any difference. Generally regarded as outdated terminology but still part of planning legislation. Lopping refers to the removal of large side branches (the making of vertical cuts) and topping refers to the removal of large portions of the crown of the tree (the making of horizontal cuts, generally through the main stems). Often used to describe crude, heavy-handed or inappropriate pruning. 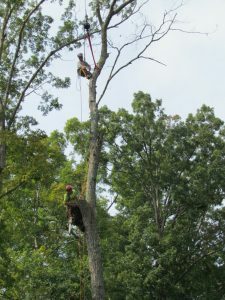 The initial removal of the top of a young tree at a prescribed height to encourage multi stem branching from that point, traditionally for fodder, firewood or poles. Once started, it should be repeated on a cyclical basis always retaining the initial pollard point, or boiling as it becomes known. The pruning back of root (similar to the pruning back of branches). This has the ability to affect tree stability so it is advisable to seek professional advice prior to attempting root pruning. Every pruning cut inflicts a wound on the tree. The ability of a tree to withstand a wound and maintain healthy growth is greatly affected by the pruning cut – its size, angle and position relative to the retained parts of the tree. 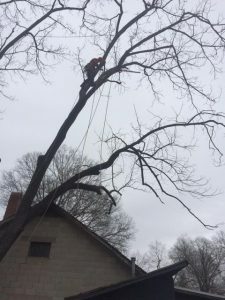 As a general rule branches should be removed at their point of attachment or shortened to a lateral which is at 1/3 of the diameter of the removed portion of the branch, and all cuts should be kept as small as possible. Examples of correct pruning cuts are shown as follows. Cherry, Plum and related trees (Prunus species) should be pruned soon after flowering to reduce the risk of bacterial infection. Maple, Birch, Beech and Walnut should be pruned in leaf or just after leaf fall and Magnolia in high summer to avoid ‘bleeding’ (exuding sap), which, although not considered damaging, can be unsightly. 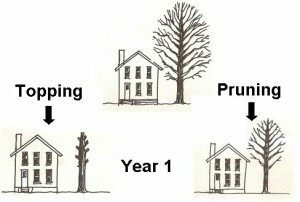 If possible, pruning should be avoided when recovery may be impaired, for example during a period of physiological stress following previous tree work or construction-related damage or seasonal weather factors such as drought.